Do you want to open a coffee shop in Bangladesh? Before you start you should know all the challenges to start a coffee shop business. It’s never being an easy job to set up and run a coffee shop in Bangladesh. When opening the business there are several issues. The number one issue is finding a suitable location assuming you know how to run a coffee shop, and if you do not then go find out how they work. In addition, it’s a combination of the location and the lease costs. Although choosing the best location is often more expensive, it’s often worth. On the other hand, you’ll still need to plan for your upcoming week by doing payroll, accounting, marketing, getting vendor supplies, going to the bank, and having roasted coffee beans delivered on time, aside from the day-to-day operational management of your coffee shop business. Mornings will be your biggest rush and challenging if you’re in a typical coffee shop. From having no place in the everyday lives of the people of Bangladesh to a new position as a harbinger of liberal values and Western culture, this article is about the transformation of coffee. While combining the authors’ experiences and perspectives, this paper explores the tradition of tea culture in Bangladesh and the marketing campaign for instant coffee within this culture. After that, the culture of the coffee shop in Bangladesh starts and it’s running and growing fast along with many challenges. What are Top 5 Real Challenges of Starting a Coffee Shop in Bangladesh? The learning curve of running a cafe business can be the biggest challenge for those who have little business or cafe experience. Also, it faces a new business in a competitive market with high outgoings and slowly growing sales aside from financial struggles. And it’s the biggest challenge that has been feeling the fear along with doing it anyway. Some people buy into an existing business rather than starting their own to try and mitigate the challenges of running a cafe or coffee shop in Bangladesh. The uncertainty that comes with it can put others off when for some the challenge of starting up is something to be relished. 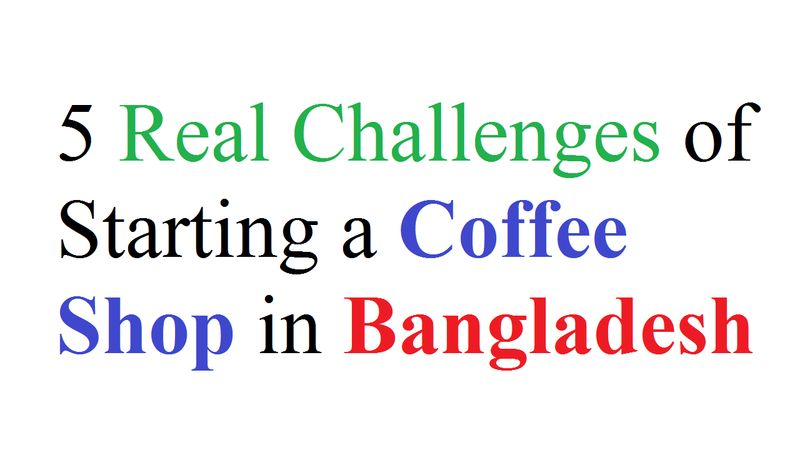 Now, let’s know top 5 real challenges of starting a coffee shop in Bangladesh. You should remember that customers not only just rate cafes based on how the baristas make coffees or how good that bacon but egg roll is. Your customers will also be looking at the overall service of your establishment with so many competing cafes they could go to. It means that you need to ensure every experience inside your café. These include from the seating and reservation procedures, placing orders, how fast the food comes out, how polite and helpful your staffs are etc. You must simplify things for your customers so that your customers become happy. That’s why you should make it fast and easy for them to get in place an order and pay. It’s not only about friendly service but remove any unnecessary hindrances to getting what they want as well. You have no excuse to make it seamless with the increase in online and pre-ordering tools for cafes and restaurants to take fast orders. And always keep in mind to make use of a responsive and user-friendly website for a convenient browsing experience along with taking the same principles as in person. Why would a customer choose to go to your café as there are so popular restaurants and in-demand coffee shops in Bangladesh? In this case, as the location of your cafe can be a factor but as the food and the beverages you’re offering are. You need to have the right menu for your customers and simply put. But, isn’t simple as it may seem to get it right. As it’s really tricky, actually, give them too few options. If they get less satisfied then give them a wide selection. But, avoid being too overwhelmed and striking the right balance can feel impossible. As a part of your research, talk to your target customers and asking them for feedback is the antidote here. If you have a quick and informal chat with them then you will understand their tastes and preferences. Also, you can ask your followers to comment on social media. When you have your menu figured out, your coffee shop now provides a world-class customer service. So, Cheers to that! However, if you don’t have enough supplies in stock all of this will be useless. And the possible solution is that get everything you need from your supplier ahead of time. As technology is on the rise, why not take advantage of it investing in an order management system? Older management platform gives you the power to place your orders through a Smartphone or tablet app within minutes because it simplifies the ordering process. You can finally get everything you need from different suppliers in a single place, at a time that suits you whether you’re busy or not. Although building a brand can be easy, its promotion is not. But, if you don’t have enough experience in marketing or don’t have proper tools or big budgets then it could be easy. You could be wasting money or affecting your business’ profits because you aren’t wooing new customers without a smart strategy. Apart from building your online presence, digital marketing is a MUST nowadays because it’s one of the cheapest ways to promote your business. Also, you should either create clever social media campaigns to earn that “internet fame”, or have a cool website where people can discover your menu and all your promotions. Facing the lack of finances is common for many businesses in this sector. As some can be operated without the cash injection, the majority of businesses do need investment to get the proper resources. You have to focus on the investors in the age of technology. But, the investors are not just the single option because there are many other alternatives present. You can make use of the invoice factoring to speed up the debit process for a few operators of the business if cash flow becomes a critical point.